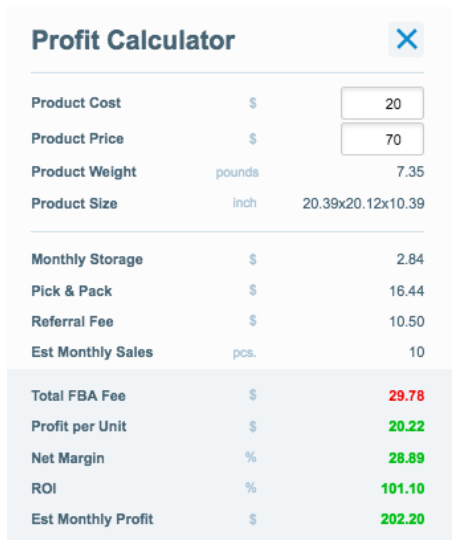 What are FBA Fees, ROI and Net Margin? Wondering how to calculate Amazon seller fees; or, how to count your profit? Having an insight into these matters is absolutely crucial for any Amazon seller. Amazon revenue calculator includes many indicators that help you to estimate your profit. Among them are such indicators as FBA fees, ROI and Net Margin. How do you analyze them? How do you decide whether to sell certain product or not? This article and our video will help you to understand that. If you want Amazon to process the customers’ orders you have to pay fulfillment fees. They include picking and packing of orders, shipping and handling, customer service and product returns. These fees depend on the size and weight of the item. Presently the fees structure changes depending on the season. After February 22, 2018, it will no longer have a separate rate for October through December. The dimensional weight calculation will also change. 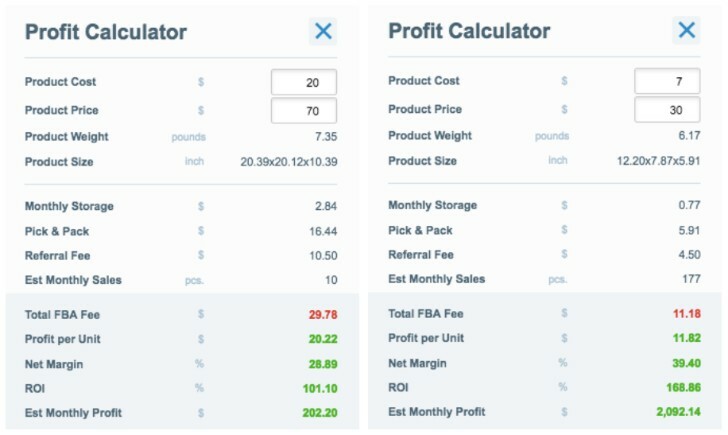 AMZScout tools include an Amazon shipping cost calculator, so you can check FBA fees for any product quickly. As an individual FBA seller, you have to pay a monthly storage fee. This fee is charged for all units stored in Amazon fulfillment center based on the calendar month and daily average volume. It is calculated depending on the size of the inventory and the season. Storage fees are naturally higher in the 4th quarter (from October to December). If a product is stored for 6 months or more, a seller might be charged a long-term storage fee. This fee depends on the size of the affected inventory and relatively high- $11.25 per cubic foot for inventory stored for 6-12 months and $22.50 per cubic foot for inventory stored for more than 12 months. Which is why most sellers try to plan their inventory to have their stock sold within 4-5 months. Whether you ship yourself or not, you have to pay referral fee for each item sold. Referral fees vary by category. Some categories have a per-item minimum referral fee. This fee is 15% of the price for the most of categories. Detailed information about these fees you can find on the page “Selling on Amazon Fee Schedule” at Amazon Seller Central. If you are an individual seller, Amazon will charge $0.99 for each item sold regardless of a product category. You don’t have to calculate any of such fees manually or wonder, “Why are my fees are so high?” afterward. You can find FBA price using our Amazon selling fee calculator. All the products you ship to Amazon must have a barcode, otherwise you will be charged $0.20 for each unit. As with labeling, Amazon has a set of strict packaging and prep rules. If you fail to prepare your products properly you will be charged. In case if a returned product needs repackaging for resale, Amazon will charge a repackaging fee. This type of fees is applied only to media products. If you decide to remove the unsold stock from Amazon, you will be charged a removal fee. You don’t have to calculate these fees are worry if they are incorrect, or wonder, “Why are my fees are so high?” afterward. You can find FBA price using our Amazon selling fee calculator. Return on investment (ROI) generally means the benefit to an investor resulting from an investment of some kind. Particularly for Amazon sellers, it means the net profit to the product cost expressed in a percentage. AMZScout tools for Amazon sellers calculate ROI quickly and easily. A simple example for you to understand the meaning of ROI. You buy 10 pieces of product (for example, some sculptures for interior design) and ship them to Amazon. The cost of each item including shipping to Amazon fulfillment center is $20. Your investment, or product cost for you, is $200. Amazon sells these statues for $70 each. Amazon commission for each item sold is about $30. After you sell all the statues you will get $400 from Amazon. Your net profit will be $200. The ROI will be 100%. It means you’ll get your investments ($200) and receive 100% profit ($200). What can you do with this profit? You can enjoy it or… invest it! Buy two times more sculptures to double your sales next month: if there is sufficient demand, of course. The net margin is a measure of profitability. For Amazon sellers, it is a net profit as a percentage of the product price. It is difficult to say what net margin is ideal. It should be higher for a small business. A net profit of 5% can be a great achievement for a big business since it’s 5% out of a large sum of money. Either way, you should always consider the net margin along with the sales volume to have a better insight into your Amazon business so you can make adjustments that benefit your long term strategy. Let’s say that you have some products in mind and you would like to see if you should launch some, or any of them. How can you compare a few totally different products? Which product should you launch on Amazon? Let’s imagine you have two different products. The price of the first product (sculptures) is $70. It yields a net profit of $20 per unit. The second product is a designer mug. It is cheaper ($30) and yields a lower net profit (approximately $11 per unit). At this point It may seem that the first product is the better choice, that is until we calculate the net margin. The net margin of the sculptures is 28% and the net margin of the cups is 39%, in other words the cup is a more profitable product. Additionally, the sales of cups are higher, meaning they can potentially yield a greater monthly profit in comparison to the sculptures.